Western blot analysis of extracts from NCI-H526 cells using c-Kit (D13A2) XP® Rabbit mAb (Biotinylated). 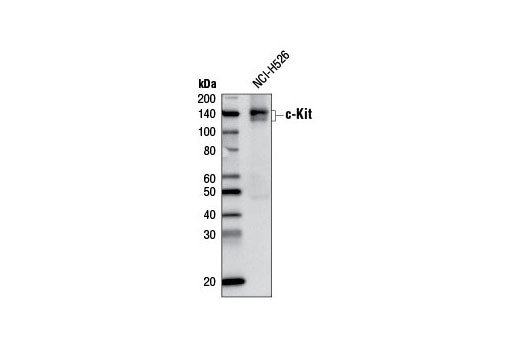 c-Kit (D13A2) XP® Rabbit mAb (Biotinylated) detects endogenous levels of total c-Kit protein. It does not cross-react with other receptor tyrosine kinase family members. Monoclonal antibody is produced by immunizing animals with a synthetic peptide corresponding to residues surrounding Tyr703 of human c-Kit protein. This Cell Signaling Technology antibody is conjugated to biotin under optimal conditions. The biotinylated antibody is expected to exhibit the same species cross-reactivity as the unconjugated c-Kit (D13A2) XP® Rabbit mAb #3074.
c-Kit is a member of the subfamily of receptor tyrosine kinases that includes PDGF, CSF-1, and FLT3/flk-2 receptors (1,2). It plays a critical role in activation and growth in a number of cell types including hematopoietic stem cells, mast cells, melanocytes, and germ cells (3). Upon binding with its stem cell factor (SCF) ligand, c-Kit undergoes dimerization/oligomerization and autophosphorylation. Activation of c-Kit results in the recruitment and tyrosine phosphorylation of downstream SH2-containing signaling components including PLCγ, the p85 subunit of PI3 kinase, SHP2, and CrkL (4). Molecular lesions that impair the kinase activity of c-Kit are associated with a variety of developmental disorders (5), and mutations that constitutively activate c-Kit can lead to pathogenesis of mastocytosis and gastrointestinal stromal tumors (6). Tyr719 is located in the kinase insert region of the catalytic domain. c-Kit phosphorylated at Tyr719 binds to the p85 subunit of PI3 kinase in vitro and in vivo (7). Martin, F.H. et al. (1990) Cell 63, 203-11. Yarden, Y. et al. (1987) EMBO J 6, 3341-51. Gommerman, J.L. et al. (1997) J Biol Chem 272, 30519-25. Sattler, M. et al. (1997) J Biol Chem 272, 10248-53. Nocka, K. et al. (1990) EMBO J 9, 1805-13. Hirota, S. et al. (1998) Science 279, 577-80. Blume-Jensen, P. et al. (2000) Nat Genet 24, 157-62.